I was diagnosed with cystic fibrosis at Yale Children’s Hospital when I was three months old. I have 2 older brothers who do not have CF – Conor (21), and Trevor (18). I grew up in Darien and have played every sport you could name growing up including lacrosse, hockey, golf, tennis, baseball, basketball, squash, and paddle. My favorite sport is Lacrosse. I played this past spring on the Darien Youth Lacrosse 8th grade travel A team. 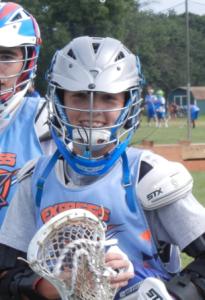 I play year round with a club lacrosse team Long Island Express North. We went to 5 tournaments this past summer and our team won 2 of them. I am currently playing for Long Island Express North on the fall team and we will be playing in 3 college recruitment tournaments this November against the best freshman players in the country. I love to play all sports but recently I have devoted all my time and effort to lacrosse. Lacrosse is the best. I play attack and just love the speed and skill needed to play the game well. Scoring goals is great but making assist passes to my teammates is really what I like the best. I also like my lacrosse teammates and coaches. They were so understanding of my situation with CF and really took a chance on me to let me play on such a competitive team. My favorite way to exercise is playing a sport, specifically lacrosse. I have played lacrosse since I was 7 with my brothers in our backyard and seems like I haven’t stopped since. Lacrosse is a great way to keep my airways open considering you never stop moving, I attribute my success with my disease to my parents always keeping me active from a young age with sports, and not treating me like I’m different from any other kid on the field, court, course, or ice. I am motivated to stay compliant with my treatments because my goal is to play high school lacrosse and then DI lacrosse in college. I have been blessed to be using the new treatment Kalydeco and it has helped me immensely as I have put on 20 pounds and have never felt better in terms of my breathing and overall health. My parents have always told me that doing my treatments everyday would keep me ready for when one day the cure for CF would be discovered and I have bought in to that belief. Kalydeco is one huge stride closer, I believe, to a cure. My role model – that is a tough question because I have so many great people who I look up to. Mr. Raymond, Mr. Barnard and all the dedicated parents that make Darien Youth Lacrosse possible are role models. Coach Waldron, Coach Muller, and Coach Schreiber are big motivators for me and are role models. My parents are also my role models. My father is the hardest worker I know and never stops. He is always looking out for my brothers and me and finding ways to help us with our lives. My mother is always there for us to help us during the day. My mom has always been a huge supporter of my goals and helps me to achieve them. My parents have been involved with Team Boomer and BEF from when I was first diagnosed with CF. Most recently my neighbor Mr. David Short ran the NYC marathon and raised money for Team Boomer. His wife, Lissa Short, has also raised money for Team Boomer and has run the marathon so many times for the cause. I also attended a Team Boomer golf event in New Jersey last fall playing with my father and played in Boomer’s group. I wear Team Boomer t-shirts and wristbands when I play lacrosse.